Delaying medical care until you are in severe pain can lead to an urgent trip to the emergency room, large medical bills and, at best, a lengthy recovery. The key to good health is addressing problems as they arise and seeking preventive care. In many ways, the health of social sector organizations is similar to our own. Without regular check-ups, problems can become chronic and difficult to reverse. When this happens, it may be a sign that the agency is in decline or crisis. Here are a few preventive health tips to keep your social sector agencies in tip-top shape. Whether you are the CEO, senior manager or a board member, it is important for you to know the organization’s vital signs. Using a dashboard of key indicators can be helpful in staying attuned to the organization’s health on a regular basis. Have board and staff take a survey to gauge their satisfaction with operations and strategy. These indicators should include the major revenue and cost drivers for the organization and should answer questions, including: Are we hitting major fundraising milestones? Are we following industry guidelines for cash reserves? Are we serving an appropriate number of clients? If you know what is typical for your organization, you will be more alert when anomalies arise and can respond quickly. 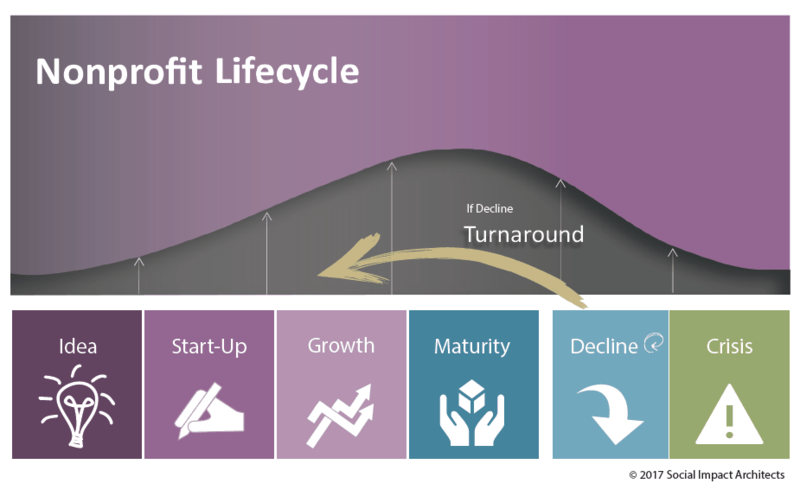 As you can see in the detailed nonprofit lifecycle graphic, the prominent theme of the decline and crisis phases is pain. When your organization is in one of these phases, you and your staff will feel stress through the continual loss of employees, inability to enroll clients in services and/or a lack of funders. While healthy organizations also experience this type of pain, the differences between the two are the duration and intensity of that pain. Here are a two simple diagnostic tools to help you determine the severity of your organization’s challenges: 1) Compare the organization’s current strategic plan with the plan from five years ago to check for progress, and 2) Benchmark your organization against similar agencies to better understand your unique value proposition. The purpose of these tests is to calibrate your pains to what is acceptable in the industry and current environment. It is critical to diagnose your organization’s pain before it is in crisis and decline. By recognizing that the organization is in or headed toward decline, leadership has time to develop a turnaround or strategic plan. While it can hurt to admit failure, waiting for a crisis to address chronic pain leaves leaders with fewer options and less time. To assess the severity of the organization’s problems, talk to internal and external stakeholders and conduct research to ensure the organization is still relevant, serving current needs and following best practices. The symptoms of decline can sometimes come on so gradually that it can be easy to miss the warning signs. But, we encourage all social sector leaders to know their organizations and be courageous in recognizing when dramatic changes need to be made so these agencies can continue to successfully serve our communities. Please share your signs of crisis or decline and tell us about courageous, difficult decisions you’ve made.